Draft 01: The Cyber Privateer Code is the #1 most-read posting. This is the strict code of conduct, kind of like "the pirate's code" referred referred to in the Johnny Depp Pirates of the Carribean movies. I called it "Draft01" because I thought for sure I'd have to make some modifications. I came up with five rules (Isaac Asimov only had 4 rules of robotics, while our Creator had ten commandments). Five rules? Not bad. I'm still nervous about the 100-to-1 penalty for inept privateering exploits, and may eventually make it only 10-to-1. The Perfect Virus principle #14: Stealth is an obvious #2 in readership. Almost as popular as the Cyber Privateer Code, this 14th of my 22 Principles for creating The Perfect Virus is kind of the reason people write viruses. They want them to be stealthy. Stuxnet about to cause an "Iranian Chernobyl" ranks very close to the top two in frequency. While this story was very popular when I wrote it on January 17th, since the tragedy in Japan it has taken on some seriously new interest amongst my readers. I think a lot of people are wondering just how good the Russians' fail-safe protocols are in the technology they've sold to Iran. Privateer analytics: high-reward/high-risk numbers is a bit of practical arithmetic. Over 78% of our Revolutionary War privateer ships were captured by the enemy. The frequency of readership that gives this topic a #4 ranking shows that people are giving some serious consideration to the risk factors. After all, if you clean out the bank account of a drug kingpin, you could be finding body parts of loved ones all over the place. How China/Russia can make (are making?) billions by slowing down the side channel shows how truly vulnerable our networked world has become, especially to nation/state-sponsored exploits. And unlike hitting drug dealer bank accounts, Wall Street doesn't appear to have any teeth with which to bite back (of course, a get-out-of-jail-free card issued by our government would quickly change that). Federal judge keeps 1-800CONTACTS from hijacking the Internet is in my opinion the most important legal decision of the new millennium. I hope Federal Judge Clark Waddoups is asked to apply his considerable legal genius to a rewrite of our idiotic federal cyber crime laws. And I am delighted that so many of my readers have stumbled onto my analysis of his ruling in this case. The Perfect Virus: All 22 principles summarized is always in the top ten. The real genius behind these 22 principles is Jeffrey L. Walker, a member of my Cyber Privateer Fantasy League team. I just took his 22 principles for creating "the perfect software application" and applied them to the world of virus creation. The exercise was essential research for the sequel to my already written novel about cyber privateering (which my new literary agent is gearing up for sale to a New York publisher). Again, various mechanics for creating The Perfect Virus are always high in readership ranking. How badly are the Chinese and Russians hurting us? is my second-ever blog post. I'm always glad to shine a spotlight and watch the cockroaches run for cover. This story still has legs, and is more relevant today than ever before. Infecting an alien architecture, Part II is my seconding posting on what I consider to be the true Holy Grail of The Perfect Virus, principle #7: Black Box Portability. While Stealth ranks #2 in all-time readership, the key to winning a full-blown Cyber War will be our ability to defend ourselves against specialized intrusion engines that have roll-your-own operating systems created by a nation/state with the resources to field a special cyber warfare engine. But at lease this topic remains in the top ten. The all-time geographic distribution of my audience shows some anomalies. 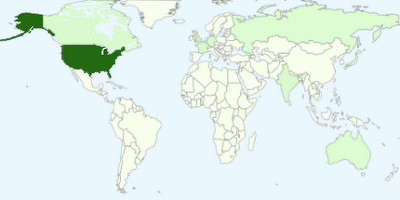 The United States is naturally the top reader. The United Kingdom is number two, again no surprise. Canada is a bit of a surprise, as they should be #2, shouldn't they? India is also a surprise, as they shouldn't be this high. Maybe Pakistan is getting on their nerves? Germany, again a surprise. Islamic nervousness maybe? France only surprises me here because they're ahead of Russia (#8). Australia. Actually, I'm sorry they're not higher on the list, as they'd be my #2 choice as a legal haven for cyber privateers. Russia. Seriously, number 8! These guys refused to jail cyber crook Darth Vader, Jr. They probably gave him a high-paying job, instead. Russia is #3 in their commitment to and resources available for cyber warfare, only behind China and the USA. Malaysia! What the heck is going on in Malaysia? Significantly not on the top-ten list are China, Taiwan and various Middle East entities. Given the attack volume on my Linux server originating in China, it's clear their government is doing a whiz-bang job censoring their access to outside information. Which is good, as far as I am concerned. I wouldn't want them paying serious attention to and investing their substantial resources in actually creating The Perfect Virus. As for Taiwan and the Middle East, if ever some regions would benefit from serious attention to cyber warfare defenses, they certainly could. Go figure.